Changfeng Motor Co.'s new sedan concept. SHANGHAI -- The Shanghai auto show used to be a showcase for foreigners to show off western car models in China. At this year's event, held in the city's Pudong district from April 20-28, domestic automakers are trying to steal the limelight by launching a large number of new models. Zhejiang Geely Holding Group Co. embarked on a multi-brand strategy earlier this year. The company is using the show to unveil as many as 22 new cars, mostly under three newly-launched brands. New cars on show include eight models under Geely's Gleagle [Global Eagle] brand, eight models under the Emgrand [Dihao] brand, three models under the Shanghai Englon brand, a Formula One concept car and two vehicles to demonstrate technical systems. The products span the entire range of light passenger vehicles, from pickups, vans and SUVs, to hatchbacks and a limousine dubbed the Chinese Rolls-Royce. Geely has not indicated which of these vehicles will be production models and which are still concepts. The company says it will not display any models now under production at the show. Chery Automobile Co. has similar plans. Chery also adopted a multi-brand strategy this year, and is displaying 32 products under four badges at the show. The four brands are: "Karry" for mini cars, "Chery" for general class passenger vehicles, "Riich" for luxury class sedans and "Rely" for business-use MPVs. Chery said new models will be on show under each of its four badges. Four new green cars, including both pure electric cars and hybrids, are also on display. 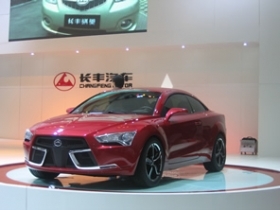 Dongfeng Motor Corp., a state-owned commercial vehicle maker, is debuting its first own-brand sedan at the auto show. The new model, under the brand of "Fengshen" in Chinese or "Aeolus" in English, will be a compact sedan. Other domestic automakers including Anhui Jianghuai Automobile Co., Shanghai Automotive Industry Corp. and Great Wall Motor Co. also are debuting new models at the show. While some of the new models will have original styling, many will be lookalikes of best-selling products from global automakers. FAW Haima Automobile Co. is debuting at least two models at the auto show, including an SUV and a sub-compact hatch back. According to covertly-shot photos of the cars published by Chinese media, one car is a lookalike of Mazda Tribute while the other looks very much like the Mazda 2. BYD Auto Co. is also debuting two models at the show, including one called the M6, an MPV with styling very similar to the Toyota Previa, and the F5, a lookalike of the new Toyota Corolla. BYD, which stands for Build Your Dreams, is part of the BYD group, a Hong Kong-listed firm in which U.S. investor Warren Buffett has a minority stake. In contrast to the enthusiastic Chinese launches, global automakers impacted by the recession are mainly showing redesigned models at the show. Only two BMW cars, one Audi and one Porsche are making their global debuts at the show. Meanwhile, the Pan Asia Technical Automotive Center (PATAC), which is GM's automotive engineering and design joint venture with SAIC in Shanghai, is launching a concept sedan under the Buick brand.